Abraham Mora Sosa, from the Dennis C. Haley Pilot School in Roslindale, during the Guppy Tank program. Sixth-grader Joleinis Mejia wants to turn her love of working with babies and animals into a career, maybe as a veterinarian or farmer. 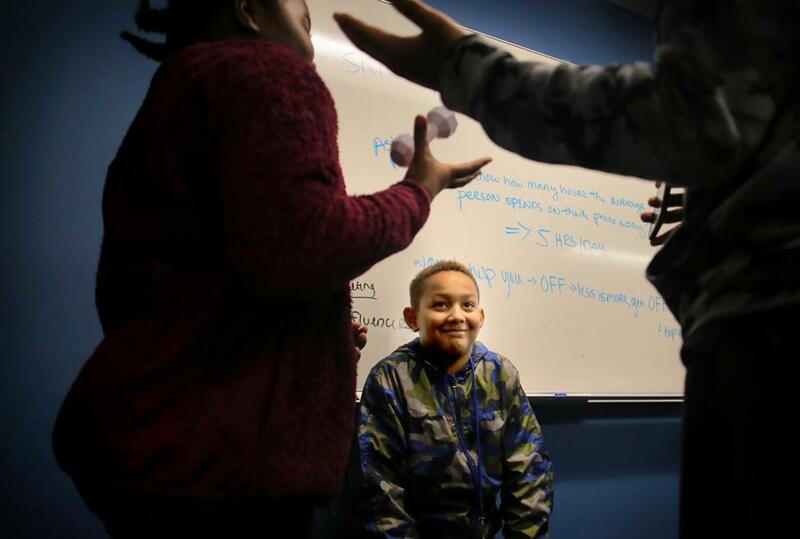 But after spending a day brainstorming and designing a mobile app at the three-floor downtown Boston office of software startup Salsify through a program called Guppy Tank, the 11-year-old realized she might be able to do good in the world by developing technology that improves people’s lives. “This could definitely be a possible job for me,” the Dennis C. Haley Pilot School student said. Guppy Tank is part of the national Tech Gives Back initiative started by the nonprofit arm of Boston’s tech community called TUGG.The three-day program included 2,000 volunteers from 60 companies across the United States, and at firms in Canada and England. The Guppy Tank concept came out of a 2016 dinner meeting of the “Ladies of Salsify.” The women, who work at the Boston-based product content management startup, pondered how to get more females into tech jobs. Salsify’s director of talent, Allison Churilla, said the group realized it needed to influence young girls in middle school, a time when their interests in math and science start to decline. The idea of using an on-site Shark Tank-style event to get kids involved with tech was born. “The need for talent in STEM careers is much greater than the talent we have to fill it so I think it’s [about] inspiring students at a young age, and then also inspiring students who may not have had the opportunities to be exposed to tech companies,” she said. The first event, in 2016, featured one class of 30 guppies at Salsify’s office. The startup launched the program on a pilot basis with a few classes and then looked to nonprofit organizations in the local tech community to help expand it. Last year, the company collaborated with the local nonprofit Building Impact — which helps other nonprofits byconnecting them with corporations — as well as TUGG , the Boston Foundation, and Boston Public Schools to grow Guppy Tank to 200 students, creating 30 apps at 10 companies. This year, the program doubled in size with companies such as coworking space provider WeWork and restaurant management platform Toast participating. On Tuesday, students from the Haley Pilot School were at Salsify to pitch “CouchPotatNo” and “track.dat” — apps they brainstormed in the classroom and then brought to life with the help of Salsify staff — that reward users with points for making healthy food and fitness choices, and “OFF,” which tracks how much time users spend on their phones. “We want our students to be able to access the innovation economy of Boston to really close the innovation-opportunity gap,” said Cam Scott, innovations systems designer for Boston Public Schools, who judged the competition alongside VentureFizz’s Colin Barry and Jodi Fortuna, academic superintendent for Boston Public Schools. “We’re looking beyond achievement gaps to really say what experiences do our students need to prepare them for the jobs of the future, which in most cases don’t exist yet,” Scott said. The innovation gap for women and people of color isn’t just a Boston problem. According to a 2018 study by the nonprofit Pew Research Center, 7 percent of computer workers in the United States are black and 7 percent are Hispanic, compared with 65 percent who are white. The US Department of Commerce reported that in 2015 women made up 47 percent of the workforce, but held only 24 percent of STEM jobs.